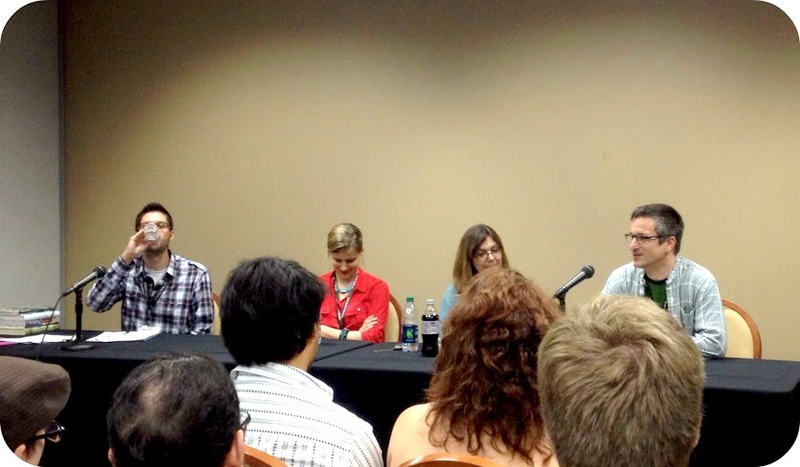 The Sunday Salon: UCF Book Festival [4.8.12] – my books. my life. Last weekend, Ben and I headed on over to Orlando for the University of Central Florida’s annual Book Festival for a day of books, authors, and bloggers. This is the festival’s third year and I’ve been there from the beginning. We started with the Writing Place: New Fiction from the South panel. Southern authors Nicole Louise Reid, Joshilyn Jackson, and Karen White. 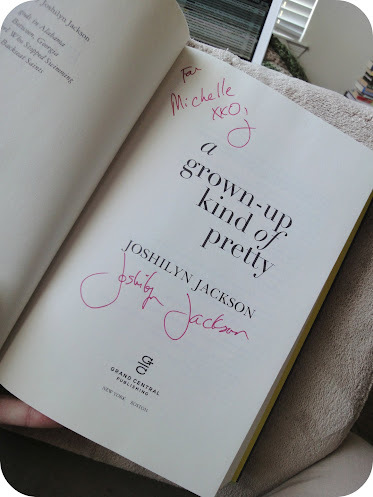 I haven’t read any of their books but Joshilyn Jackson has been on my TBR list for awhile. I picked up A Grown-Up Kind of Pretty for her to sign. But after listening to her talk and discovering that she narrates her own audiobooks, I’m tempted to listen to this one instead. Next we went to the Contemporary Voices: Literary Fiction for the 21st Century panel with Lauren Groff, Darlin’ Neal, and Michael Griffith. Again, I haven’t read any of their books before but the day is also about discovering new authors. 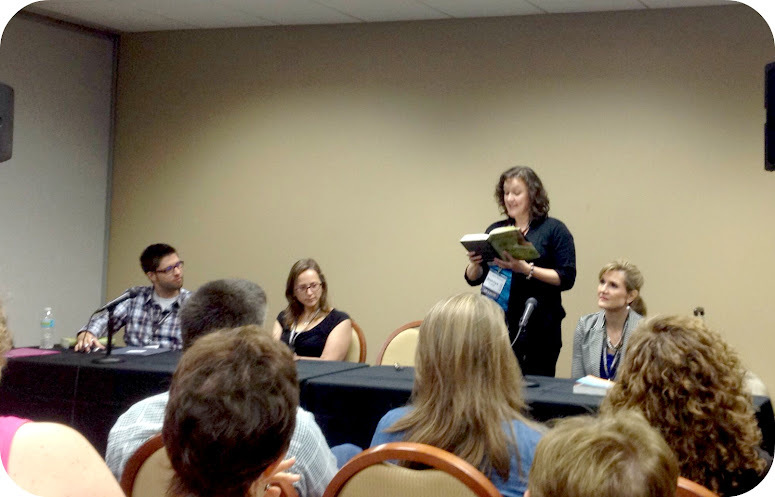 The last panel Ben and I went to was called Embracing Imperfections through Young Adult Literature with Ellen Hopkins, Jessica Martinez, Ty Roth. Most people were there for Ellen Hopkins but I was glad to see Jessica Martinez since her debut, Virtuosity, got such great reviews. 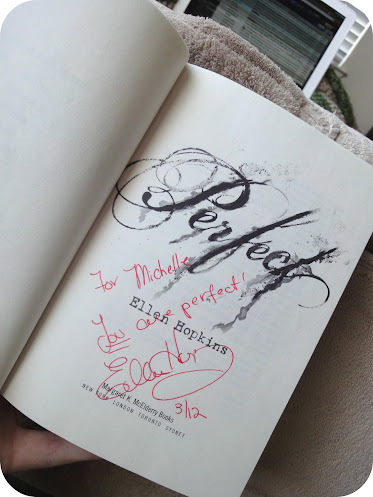 I had Ms. Hopkins sign her latest book. After the Festival, we went to dinner with a bunch of local bloggers (and we failed to get a picture!). Jenny from Take Me Away, Sandy from You’ve Gotta Read This, Heather from Book Addiction, Heather from Raging Bibliomania, and Anita from A Woman, A Wife, A Mom (who I was so excited to meet for the first time!) were all there despite the lack of photographic proof. The UCF Book Festival isn’t anything huge like some of these events I see other bloggers go through, but I always enjoy myself and I have hopes that it’s only going to keep growing. I was so glad that you could come this year! And next year of course, we expect the little one to come too, so we can fawn all over her. Thanks for the heads-up about Joshilyn Jackson narrating her own audiobooks. I’ve fallen behind on reading her, so maybe I’ll catch up that way. I was so happy to meet you too. It was year 2 for me and I so enjoyed. And yes next year we expect your baby boy to come along.